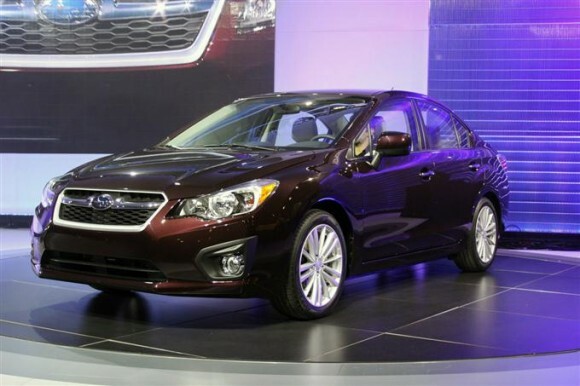 Two weeks ahead of the 2012 Subaru Impreza sedan’s full reveal at the New York auto show, the company has released this profile shot. From what we can see here, the production car will carry over many of the styling cues previewed by the concept version shown at last fall’s Los Angeles auto show. This includes the sleeker profile, prominent fender bulges, and chiseled front and rear corners, all of which are cool by us—we just hope the overall impression of “Mazda Cruze” is less pronounced when we see more angles. Subaru also announced its highway fuel-economy estimate for the four-door: 36 mpg, an impressive figure for something with standard all-wheel drive. Subie didn’t specify, however, whether that number will correspond to Imprezas equipped with a manual or automatic (likely continuously variable) transmission. Either way, figure on somewhat less-impressive city mileage, as the engine will be forced to spin up the all-wheel-drive hardware more often in urban situations where vehicle speeds are more varied. The huge jump expected in mileage—from 26 and 27 mpg highway for today’s manual and automatic Imprezas—comes courtesy of the company’s new flat-four engine. (Check out our full write-up of the engine.) While a 2.5-liter variant of that mill already has found a home in the Forester, we expect that the Impreza will receive a 2.0-liter. Engines in this new family don’t add much (if any) power compared to the units they replace, but they do employ numerous friction-reducing measures and improved breathing and cooling.